Designing a pool space has more elements than just figuring out the shape of the pool you want. Once you have the shape of the pool figured out, the next step is ensuring the pool is safe for use and when not in use. Today we are looking at a series of swimming pool accessories that will help you with designing the perfect pool space for the summer. Designed for fast, solid starts, the Velocity Starting Platform is the next generation of starting blocks. Engineered with injected resin transfer technology, the footboard has outstanding strength as well as a sleek, uniform, high-tech appearance. For over 85 years, S.R. 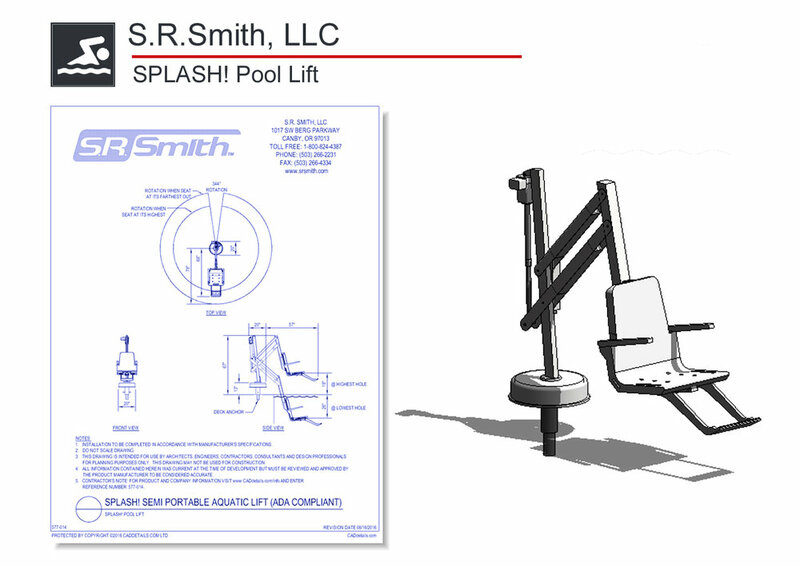 Smith has been making state-of-the-art diving boards, pool slides, rails and ladders that make pools more fun and safer to use. We built our reputation on our fast, reliable turnaround times, ability to do custom work and the highest level of customer service. Our quality and fast turnaround times have been recognized in our industry by many awards that we’ve continued to win, year after year. Comprised of our U.V. resistant TPR (thermoplastic rubber) mixed with Flecks® two-part chlorine resistant aliphatic urethane, Water Flecks® is designed to withstand long-term exposure to chlorinated water. In addition to our anti-microbial properties, Water Flecks® does not contain any harmful metals or other chemicals that could leach out into the water. Water Flecks® does not contain any harmful metals or other chemicals that could leach out into the water. Water Flecks® is installed as a seamless rubber safety surface alone over concrete or with our patented EnviroFluff® cushion layer which is a proprietary energy absorbing foam making Water Flecks® the only seamless rubber surfacing system that will not break down over time due to chlorine or U.V. exposure. This two-rail design features clean, simple lines and quality engineering. Available in Residential Series, Residential Series Premium, Commercial Series, and Commercial Series Premium. Ultra’s Premium grades have a reinforced double-wall rail with hidden fasteners. The PAL2 includes all the great features of our original PAL pool lift, with a modernized look and durable matte finish. It is a portable, free-standing pool lift that comes with the PAL Secure-It Kit so that it can be fixed to the deck. Standard features include the LiftOperator® Intelligent Control (mounted on the mast), a 24-volt rechargeable battery, waterproof hand control, footrest and seatbelt assembly. Sit up and enjoy the the view in our upright, high back Chair. The Chair sits upright, offering supreme comfort and functionality. 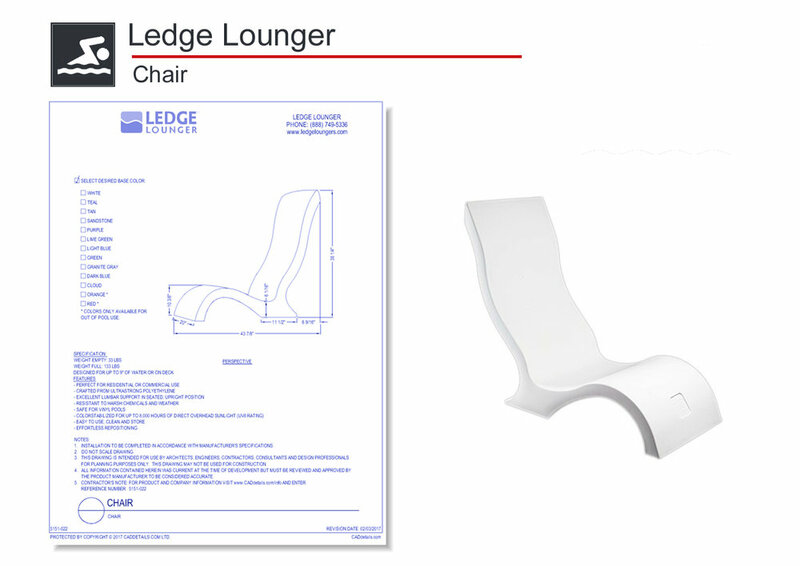 Whether you want to sit on the pool's ledge, the deck, or even the beach, the Chair is the perfect upright seat. Made with the same high quality materials and contemporary aesthetic as our other products, our Chair upgrades the poolside experience with more ways to soak up the rays. Simply submerge it in the pool, let it fill with water, then place it in the desired location for endless hours of relaxation. Our Chaise provides a contoured, comfortable place to relax on your tanning ledge or Baja shelf. Made from durable and color-stabilized material, this elegant lounger delivers sleek style in a weather-resistant form. It’s ideal for ledges with up to 9 inches of water and easy to set up. Simply submerge it into your pool to let it fill with water and pull it onto the ledge — two quick steps for an indulgent sunbathing experience. Whether it’s a bottle and some mixers, or some cans, grab another drink without getting up. Featuring a 360 degree drink ledge, there is a spot for your drink, music player and other personal items. Made from our long-lasting and color-stabilized material, this Ice Bin Side Table is designed for in-pool use. The LS375LED is a compact, surface mounted fountain light designed for high performance applications. Constructed of both high pressure die-cast copper alloy and high-strength polymer, the LS375LED represents the next generation of compact fountain lighting. The LS333ANS-2LED is a swimming pool-rated luminaire, and one of Lumascape’s most popular luminaires. It is constructed entirely of 316 marine grade stainless steel, and has a special alignment feature to ensure the beam of light is perpendicular to the installation surface, even if the wet niche is not. The use of LED allows for the creative introduction of color and improved energy efficiency. The Saline C® 6.0 and Saline C 11.0 NSF certified commercial salt chlorine generators are designed to produce up to 6 lbs or 11lbs of chlorine per day. Their compact designs are comprised of a single clear vessel and power supply, eliminating the need for daisy chaining multiple cells. This more-efficient design lowers installation costs and consumes less space. Hayward Commercial Pool's Universal H-Series ASME gas heaters are designed and certified for commercial use. The flagship of our H-Series line encompasses high-end features and construction materials as standard. They combine industry-leading hydraulics, exceptional performance, energy efficiency and reliability, with planet-friendly low-NOx emmissions. Flexible connection options make them ideal for new or existing applications. Choose from 250,000, and 400,000, and 500,00 BTU natural gas or propane models. Take a ride on a wild slide with the Vortex Pool Slide from SR Smith! It’s 360 degrees of action with this commercial quality slide that pumps out 30 gallons of water a minute for some raging rapid fun. Simple to install and can be connected to your pool’s return line or a standard garden hose, The Vortex looks as cool as it is fun when effortlessly installed on your pool deck. Looking for additional pool design files? Download our pool equipment QuickPack here.